For today’s film we wanted to try a new straight to video film and I picked from a franchise that I actually enjoyed watching. You know I didn’t realize that J.J. Abrams, the man helming the new Star Wars movie actually was a writer for the original Joy Ride. 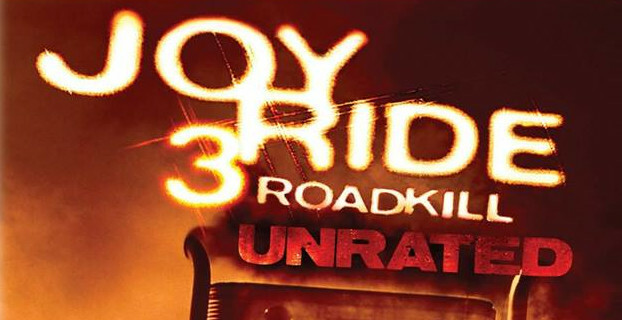 Our crazy serial killer trucker Rusty Nail (Ken Kirzinger) is back for more in the third film in the Joy Ride series called Joy Ride 3: Road Kill. A racing team is getting ready to head up to Canada for a big race when one of them decides to be stupid and almost runs Rusty and his rigg of the road. Well, Rusty takes offense and decides to stalk Jordan (Jesse Hutch) and his friends as he picks them off one by one while throwing demands at Jordan. The film also stars Ben Hollingsworth (Diary Of A Wimpy Kid: Rodrick Rules) as Mickey, Gianpaolo Venuta (The Words) as Austin, Jake Manley (Hemlock Grove) as Bobby, Kirsten Prout (The Twilight Saga: Eclipse) as Jewel, Leela Savasta (Black Christmas 2006) as Alisa, Sara Mitich (Prick) as Candy, Dean Armstrong (Saw 3D: The Final Chapter) as Officer Williams, and the film was directed by Declan O’Brien (Wrong Turn 5: Bloodlines). Like all horror films before it, it starts with the pop which is supposed to be the opening sequence that is supposed to hook you into the film and it was a good one in this film’s case. Some of the kill scenes in the film were actually pretty darn good even though the tire jack crushing the human head kill reminded me a lot of the head in the vice kill in the film Casino. Ken Kirzinger is a legendary stuntman that has been in some amazing movies and he even took the role of Jason Voorhees in the Freddy Vs Jason film. He is definitely the MVP of the film and during one of the scenes when he is choking someone out, you can see Jason Voorhees from that film in this one. The scene in the diner with that waitress was a little awkward and Jake Manley was right that she resembled Large Marge from Pee Wee’s Big Adventure just without acting chops. If I was to describe this film, I would say that it was a cross of Need For Speed with Duel (the 70’s film) which had the man constantly being chased by the crazy trucker. Overall, I really enjoyed watching the film for what it is and I think it’s worth giving a watch if you are a fan of slasher films. 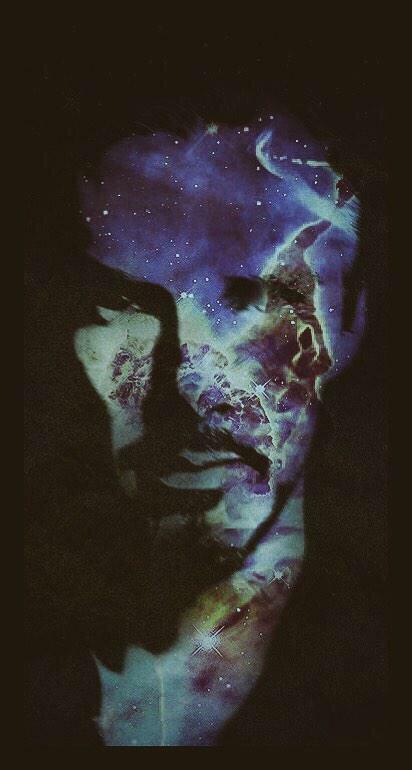 I am going to give this film a C+ only because it does have it’s faults. Apparently, the saga of the new Star Trek movie which has already lost two directors with Robert Orci being the latest to quit the project while J.J. Abrams was forced to quit due to his commitment to the Star Wars franchise. 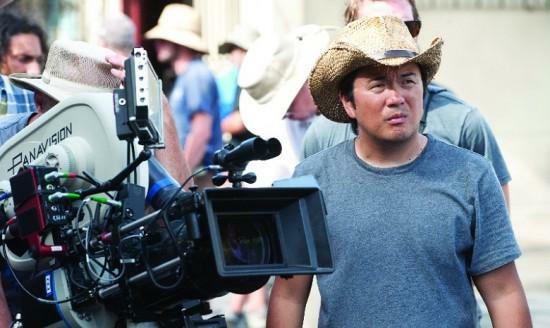 Paramount Pictures announced that Justin Lin, the man behind four sequels in the Fast And Furious franchise (He directed parts three through six) is taking the helm on the USS Enterprise. The only question at hand is how are fans of the franchise (they are diehards) going to react to the hiring of Lin. David Ellison and Skyline Prods will be producing the film alongside Abrams and Orci, but Paramount has not yet established a release date for Star Trek 3. Stay tuned here for more info as it becomes available to us. Apparently, some information may have been released through the recent Sony hacking incident, but it looks like Marvel Comics and Sony Pictures have come to an agreement over the use of Spider-Man in the future. While Marvel is being successful and deep in phase 2 of their Marvel Cinematic Universe, one character was a key factor in the next installment of Captain America and how they want to explore the Civil War story. Spider-Man is a very key figure in that storyline to the point that the two companies have agreed to some terms according to a source of mine. Here is what the two companies agreed to according to Nerdreport.com, “Sony had negotiated a deal with Marvel to produce the Spider-Man movies and STILL retains the production rights to the Spider-Man films and merchandise that come from it (i.e. Sony keeps profits from the black guy, blue-glowy Electro, but Marvel can keep all the profits from the white guy, yellow and green Electro). But Sony had been stingy with releasing the rights because, well, Sony wants all the money (same goes for 20th Century Fox’s ownership of the X-franchise, but that’s another article).” If this is true we could see something very special in the film so let me explain. Spider-Man apparently is one of the guys that agrees with the act where the public has a right to know the secret identities of the superheroes and he reveals himself to the public and in turn he gets a new modernized suit thanks to Iron Man. I am super excited over this news more than anything else. For fans of the Teenage Mutant Ninja Turtles franchise received great news that they were hoping was going to be in the first remake. 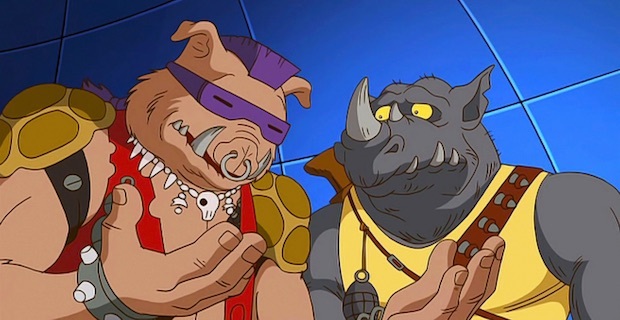 That’s right, some fans were a little disappointed when they found out that Bebop and Rocksteady were not going to be in the first film when it was reported that it was a possibility. Now, the fans can expect to see the duo in the next Teenage Mutant Ninja Turtles film according to an interview with a Brazilian show that Producers Brad Fuller and Andrew Form did. Here is what they said, “We can say that Bebop and Rocksteady are in the film, and Casey Jones is a character that we love and we’re trying to fit him in as well.” We also know that Earth To Echo director Dave Green is in talks to direct TMNT 2 since it was reported that Jonathan Liebesman would not be back to direct. There is no actual word if Casey Jones or Krang will make it to the film, but the producers have expressed an interest in exploring the dimension x story line. Stay tuned here for more info as it becomes available. I just heard through the grapevine that Star Trek 3 lost yet another director as Roberto Orci who co wrote the first two films has dropped out. The studio was looking for a director since J.J. Abrams left to direct the Star Wars sequels and now they’ve once again ran into a brick wall. There’s no word yet on why Orci decided to leave, but rumor has it that Edgar Wright could be a possibility to direct Star Trek 3. Actor Mark Wahlberg is looking to have a blemish on his record erased for good as he applied for a pardon in the state of Massachusetts. When Mark was 16 years old, he attempted to rob someone and left the man blind in one eye after he failed in 1988. 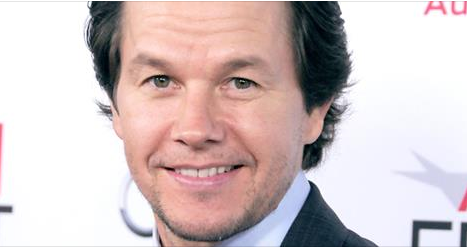 According to NECN, Mark Wahlberg stated on his application that he has dedicated his life to becoming a better person and also stated, “I am deeply sorry for the actions that I took on the night of April 8, 1988, as well as for any lasting damage that I may have caused the victims.” Wahlberg applied for the pardon due to the fact that he wants to obtain a concessionaire’s license for a restuarant he wants to open and to help the police mentor troubled kids. Mark states, “My hope is that, if I receive a pardon, troubled youths will see this as an inspiration and motivation that they too can turn their lives around.” We’ll have to see what happens and if Massachusetts grants him this request.